Title Series: Chūnibyō demo Koi ga Shitai! What the mortal eye sees is a mundane, tranquil world. What the Wicked Eye sees is a vast, exotic land filled with extraordinary ideas and concepts, and the only one who can see this is the wielder of the Wicked Eye herself: Takanashi Rikka. A bicycle turns into a motorbike that travels at mach speed. An umbrella turns into a gun-blade twice Rikka's size. A spice rack in a grocery store is a laboratory filled with strange, mystical potions. 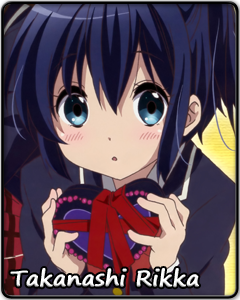 These are some of the things that only Rikka can see. As much of a gift as the Wicked Eye is, it is also a curse. Because she is the only one who can see this, no one is able to understand her or realize what she is going through. She walks alone in this mystic realm with no one to call a friend, no one to consider a companion, no one to go back to as a guardian. Yet, Rikka continues to search for the Ethereal Horizon, a realm where she can be herself, where she can find the true peace she has always longed for. If the path to that place is filled with thorns, then so be it.